Free Shipping Included! 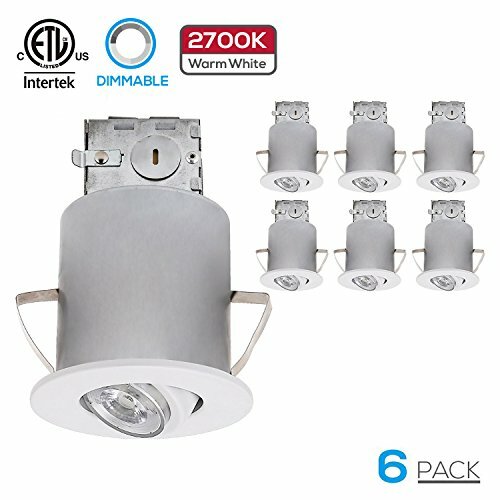 TORCHSTAR Recessed Lighting Kit: 3-Inch ETL-listed Airtight IC Housing + White Swivel Trim + LED Dimmable GU10 Light Bulb Warm White, Rotatable Spotlight, Decorative Retrofit Downlight, Pack of 6 by TORCHSTAR at N Online Agency. MPN: OMDRH-6P3GU10-WHTRLT. Hurry! Limited time offer. Offer valid only while supplies last. This 3-inch recessed lighting kit contains all the supplies you need to create that uniform and focus spotlighting for your interior space. This 3-inch recessed lighting kit contains all the supplies you need to create that uniform and focus spotlighting for your interior space. when overheating and back on again when cools down, eliminate a hidden safety hazard and provide you a care-free operation for your daily operation. show objects' true and realistic color, perfect for use in displaying paintings, artwork, merchandise or on areas that need a bright 'attention'. holes or unsightly & torn drywall caused by the removal of existing trim. Comes with 3 years product warranty for customer's rights and benefits, satisfaction guarantee. Note： Please copy and paste B0125XSDBC in the search bar for the new-Style backup bulb which is different from the original factory bulb in appearance while performs better.